School’s just around the corner in Champaign-Urbana, but there is still plenty of summertime fun to be had! We’ve given you our list of 101 Days of Summer in Champaign-Urbana and Beyond, Part #1 for days 1-33. 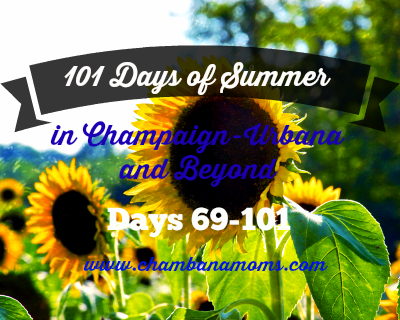 Then we rolled out 101 Days of Summer in Champaign-Urbana and Beyond, Part #2 for days 34-68. Now to finish out the summer in Chambana style! 69. Take the kids out to a Normal Cornbelters game. 70. Enjoy Youth Musical Theater at a performance of the Urbana Park District’s Annie. 71. Hum along to CUTC’s Mary Poppins at the Virginia Theater in Champaign. 72. Watch the tractor pull at the Georgetown Fair. 73. Chalk it up at a sidewalk chalk contest. 74. Get your family groove on at Friday Night Live in Downtown Champaign. 75. Watch the fireworks at the St. Joseph Community Festival. 76. Attend Chicago Bears Training Camp Practice. 77. Watch an Illini Football Summer Camp open practice in Rantoul. 78. View a summer movie on the Quad. 79. Visit the Alma Mater for a back to school picture. 80. Stop in for some Cocomero after your Alma Mater pic. 81. Play with acoustics on the Quad outside Foellinger Auditorium at the famed echo spot. 82. Whip up some stir- fry (for free!) at Flattop Grill on Campus. 83. Watch the talent show at the Villa Grove Ag Days. 84. Sign up for the Fighting Illini Kids Club. 85. Explore at the Orpheum Children’s Science Museum. 86. Play indoors at the FCC indoor playground. 87. Take a Tour of the Krannert Center of the Performing Arts. 88. Swim at a new favorite public pool at Lytle Park Pool in Mattoon. 89. Discover something new at the Spurlock Museum. 90. Find a new favorite art work at the Krannert Art Museum and Kinkead Pavilion. 91. Learn all about bees at The Pollinatarium. 92. Get gnarly at the Spalding Skatepark. 93. Gather your big kids for some paintball on the Salt Fork. 94. See how the reindeer “summer” at Hardy’s Reindeer Ranch. 95. Take a Tour of the Krannert Center of the Performing Arts. 96. Learn all about geocaching in Urbana and Homer Lake. 97. Eat some Dragon Ice Cream at the Illinois Renaissance Festival in Danville. 98. Enjoy carnival rides and music at the Sangamon River Music Festival in Mahomet. 99. Watch the demolition derby at the Hoopston National Sweetcorn Festival. 100. Score some free cheese at the Arthur Amish Country Cheese Festival. Did we miss something? Add it in the comments below!